RIO DE JANEIRO, Feb. 8 (Xinhua) -- Fourteen people died in a shooting in a Rio slum on Friday, local authorities said. 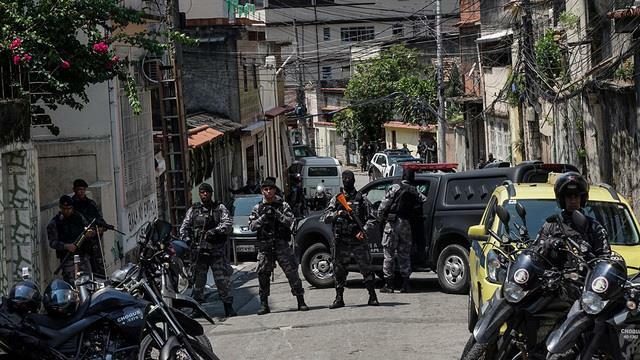 The shooting occurred in the Fallet-Fogueteiro slum, located in the Santa Teresa neighborhood, which is close to Rio's historical center and has some tourist spots, in Rio's downtown region. According to the Rio police, drug dealers were in a confrontation with policemen from the Special Operations Command. The identities of the 14 dead were not disclosed. Although there has been no official confirmation, the dead are suspected to be all drug dealers from a local gang in the slum. The police said they were carrying out an operation to fight drug trafficking in the area with the support of the riot control forces. Officers reportedly have received an anonymous tip about a group of drug dealers who gathered in a house. The police seized some rifles and several handguns as well as grenades. Three drug dealers tried to escape in a school van but were arrested. The Fallet-Fogueteiro slum has been the site of a gang war in recent months, as criminals from another gang have been trying to take over the slum and drug trafficking there.